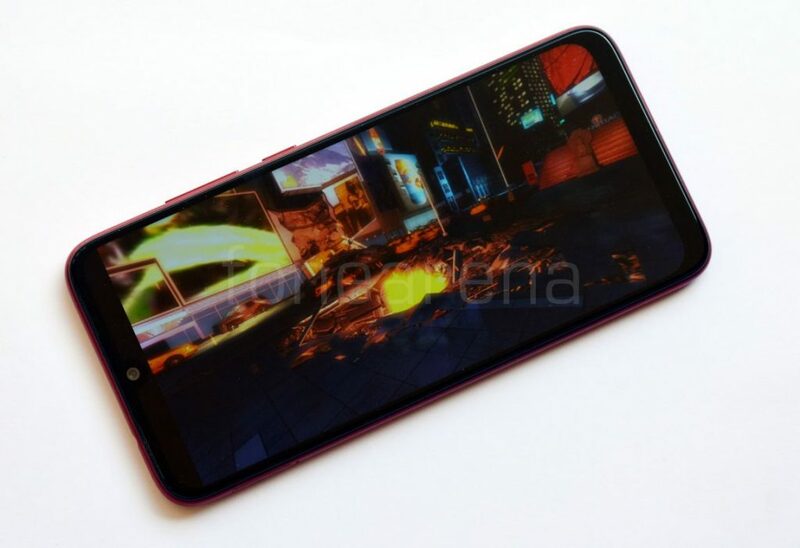 Xiaomi launched the Redmi Note 7 in India last month starting Rs 9,999, powered by an Octa-core Qualcomm Snapdragon 660 64-bit 14nm mobile platform based on FinFET technology with Adreno 512 GPU that has support for Open GL ES 3.2, Open CL 2.0, Vulkan graphics and Hexagon 680 DSP that includes Hexagon Vector extensions (HVX), designed to support Caffe2 and Tensorflow for machine learning and image processing using the Snapdragon Neural Processing Engine SDK. 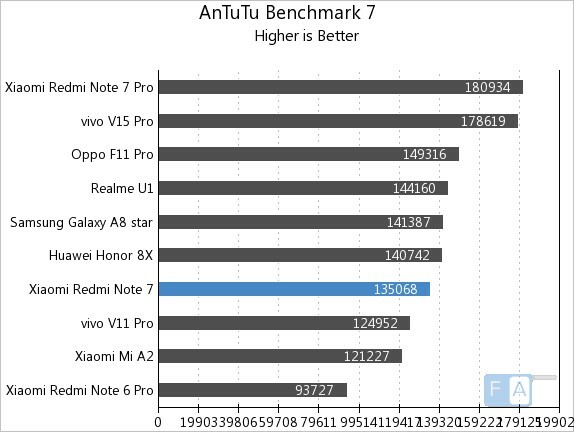 Redmi Note 7 scored 1,35,068 points in the AnTuTu Benchmark 7 beating Vivo V11 Pro and Mi A2 which are also powered by Snapdragon 660 but it fell behind Kirin 710 powered Honor 8X and Helio P70 powered Realme U1. 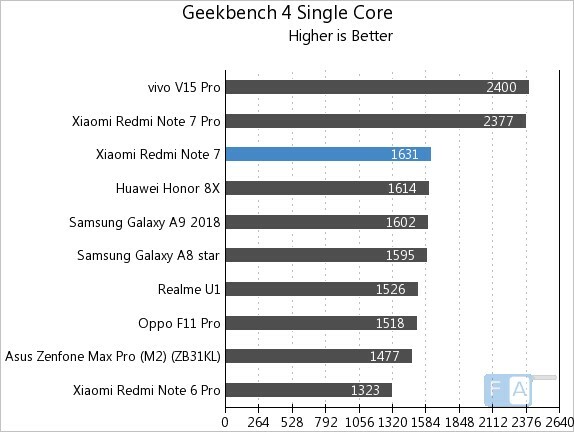 It scored 1631 points in the Geekbench 4 Single-Core benchmark beating Honor 8X, Realme U1, and Asus Zenfone Max Pro M2. 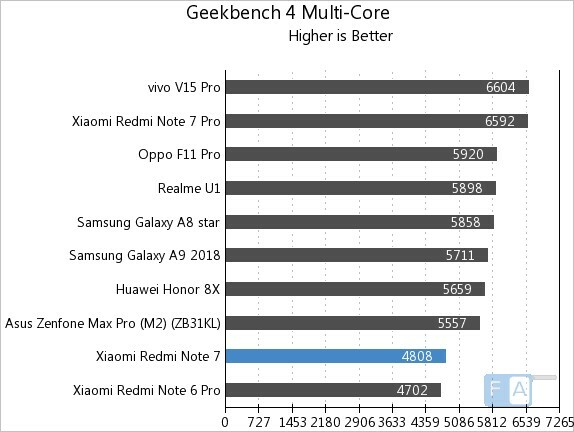 It scored 4808 points in the Geekbench 4 Multi-Core benchmark which is significantly lesser as compared to Asus Zenfone Max Pro M2, Honor 8X and Realme U1. 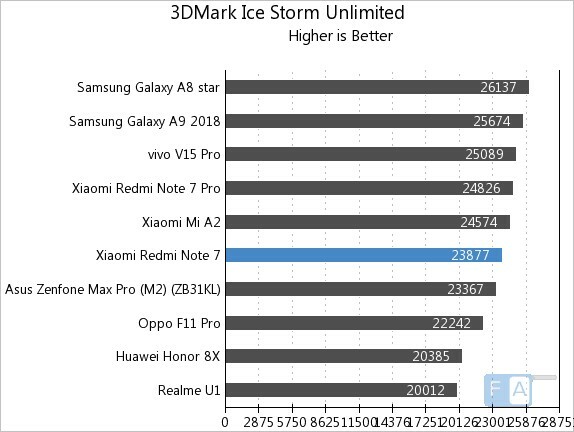 It scored 23877 points on 3DMark Ice Storm Unlimited GPU beating ASUS Zenfone Max Pro M2, Honor 8X and Realme U1 but lost to Mi A2 by a little margin. 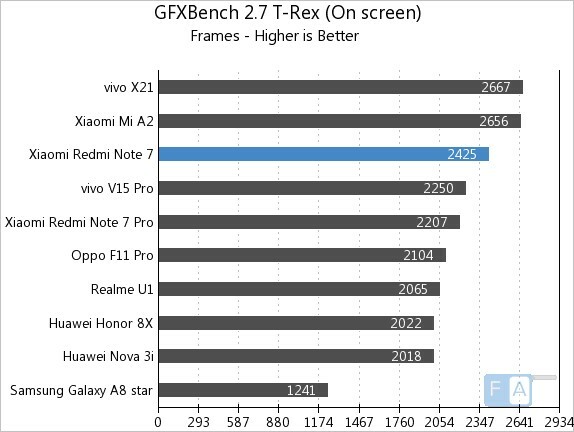 It clocked 2425 frames or 43 fps in the GFXBench 2.7 T-Rex OnScreen benchmark beating Snapdragon 675 powered Redmi Note 7 Pro and Vivo V15 Pro. 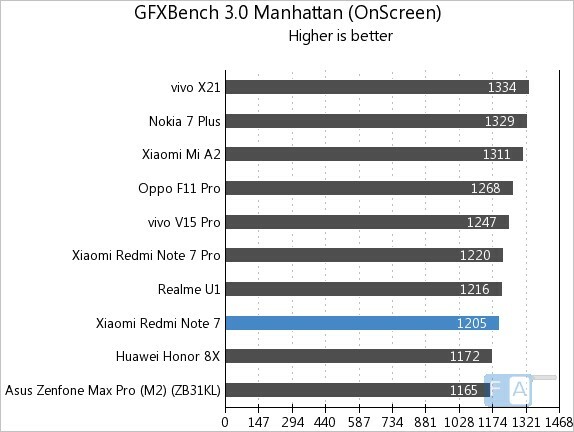 It clocked 1205 frames or 19 fps in the GFXBench 3.0 Manhattan OnScreen benchmark beating Honor 8X and Asus Zenfone Max Pro M2 but lost to Nokia 7 Plus, Mi A2 and Realme U1. 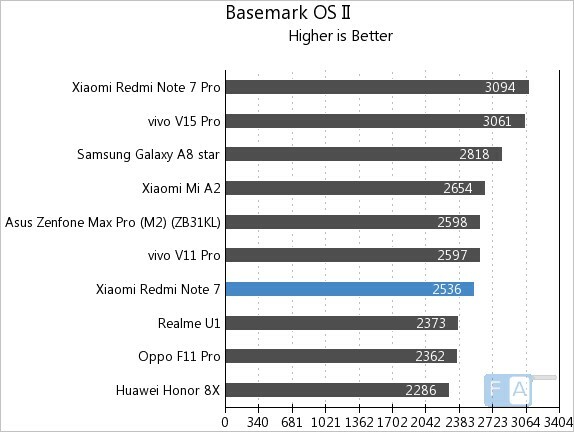 In the Basemark OS II benchmark, it scored 2536 beating Honor 8X and Realme U1 but lost to ASUS Zenfone Max Pro M2 and Mi A2. 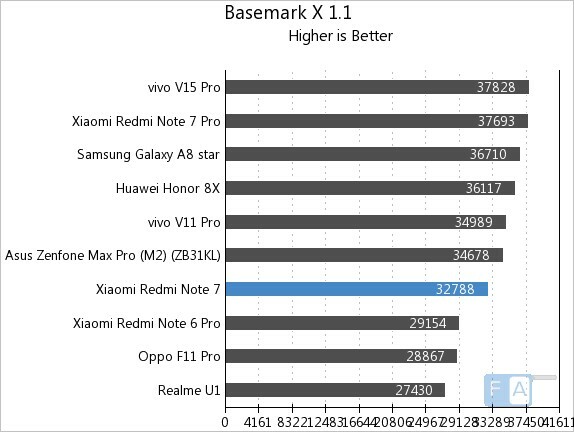 In the Basemark X 1.1 benchmark, it scored 32788 beating Realme U1 but lost to Honor 8X, Vivo V11 Pro and Asus Zenfone Max Pro M2. Looking at the benchmark scores, it’s difficult to pick a clear winner amongst Snapdragon 660, Kirin 710 and Helio P70, but Snapdragon 660 has an edge over Kirin 710 and Helio P70 because of it’s Adreno 512 GPU which can be seen from the benchmark scores but remember, these are just synthetic benchmark scores and we will bring you the real-life performance test results in the review soon.